DENVER, Aug. 26, 2008 /PRNewswire/ -- An official Guinness Book of World RecordsTM attempt to display the largest ever protest sign has succeeded. The 530-foot tall and 666-foot wide message is being shouted from the mountaintops overlooking the Democratic National Convention with the leading 2008 protest message. Columbine dad Brian Rohrbough, whose son Daniel was murdered at that high school massacre, as the president of the non-527 group American Right To Life, has said: "When we tell kids that unborn children can be killed if their parents don't want them, we rob them of the knowledge of the God-given right to life and we destroy their moral foundation. Abortion is wrong because it's a baby; it's always wrong to intentionally kill an innocent baby." Guinness assigned American Right To Life an official world record attempt number: 228132. The protest sign weighs more than 2,700 pounds and was sewed together with more than four miles of seams connecting 2,400 sheets and backpacked onto location and unfurled by 44 letter carriers with spotters a mile away to ensure proper letter placement. (See the follow-up expert verification report as requested by Guinness.) After three hours ARTL removed the DNC Sheets Of Shame and left the area cleaner than it had been. Photo taken from 1.8 miles away at Indiana and 55th Ave.
ARTL Runs Circles Around Liberals: The Denver Post said, "Anti-abortion demonstrators have been among the most visible and active groups at the Democratic National Convention." Then Catholic.org and the American Thinker reported, "The most visible and vocal protestors demonstrating at the Democratic National Convention are the advocates for the unborn. ...they are everywhere and in the faces of delegates. Undaunted by the heat, the ridicule, and the tight restrictions placed on them by the city... these soldiers for life battle on." Then the Colorado Springs Gazette editorial page editor agreed. "Far left activists who promised convention mayhem mostly made fools of themselves. They had no coherent message... Not so, regarding pro-life activists. 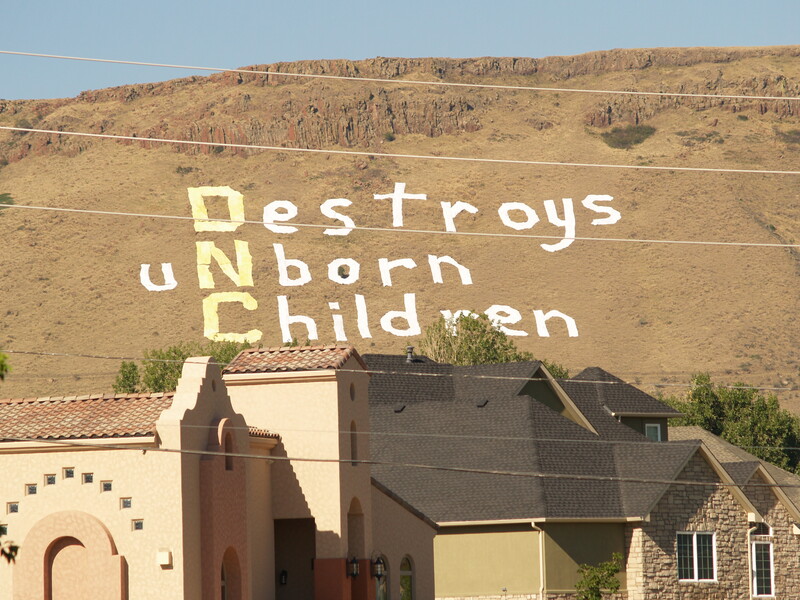 They were seemingly everywhere in Denver... And then there was the little matter of that giant message that showed up Tuesday morning on North Table Mountain... that said 'Destroys uNborn Children.'" ARTL is also a lead sponsor of the DNC Power in the Park protest event by national black leaders at Denver's Martin Luther King Jr. Park and of the Clinton Watch project at Denver area "adult" clubs. And Colorado's Fox News used video of the world's largest protest sign as b-roll during an interview with ARTL regarding Dr. James Dobson breaking his oath made invoking God's name in which he pledged to never vote for a politician who would kill a single child by way of so-called pro-life "exceptions." The ARTL sign seems to unfurl itself as the hikers cannot be seen from this distance. A government scientist on ARTL's site selection committee centered a local coordinate system in the lowercase "o" and met three criteria. 1) the mountain slope had to be visible to hundreds of thousands of people and to major interstates 2) it had to have a steep enough angle to make the sign (which was elongated to compensate) easily readable, yet less than a 45% slope to avoid injury 3) the site had to be at least a half-mile from the nearest roadway to minimize interference from the police and angry pro-aborts. Mission accomplished! Widespread Reporting: The ARTL Sheets of Shame project has been everywhere in the news. (The following links appear for the record.) Millions of people learned of the ARTL sign condemning the child-killing Democrats at the DenverPost.com, WorldNetDaily.com, the permanent entry for the 2008 DNC at Wikipedia, YouTube, KRNV News 4, Google News, Yahoo News, ProLifeAction.org, Jill Stanek.com, International Business Times, Tony Phyrillas, PRNewswire, Colorado Right To Life, ProLife America, CovenantNews.com, TheAmericanView.com, Highbeam.com, Earthtimes.org, LifeNet, Theology Online, BreitBart.com, Examiner.com, Wikio, (and many more). ¿Y se habla Espanol? Various Spanish outlets reported on ARTL's Sheets of Shame including Yahoo News in Spanish and when it was televised on Telemundo, the world's second-largest Hispanic TV network! Also internationally, that DNC means Destroys Unborn Children was reported in Canada and Europe, including in London's Guardian newspaper and earned a PicOfTheDay for Reuters photographer Rick Wilking! And the protest experts at AmericanProtest.net analyzed the ARTL protest effort, stating that the DNC should have known that Denver was the home of American Right To Life and regarding their locating the convention in Denver, asked, "What were the Pro-Abortion Democrats thinking?" Yes, these killers of unborn children, what are they thinking? See ARTL's 6-page Sheets of Shame pdf file showing amazing photos and some of the scores of backpacks weighing from 40 to 85 pounds.